Halkbank ad Skopje recently released new set of upgrades for their mobile banking application that makes everyday banking even more convenient for their retail clients. Omni-channel platform provided by their partner New Frontier Innova (NF Innova) was further improved providing support for implemented functional and performance enhancements. Halkbank ad, Skopje is a steadily growing brand which operates with a global vision through innovative products and services. Halkbank ad, Skopje was established in 1993 as a joint stock company to perform universal banking operations in the Republic of Macedonia. Innovation in new products and services is one of Halkbank strongest features. Being the first downscaling bank, creating products and services for micro clients made Halkbank ad Skopje the leader in broadening the vision of the banking system in Macedonia. Another step forward, regarding banking services on the Macedonian market, is the beginning of using credit authorization, which was firstly implemented by Halkbank ad Skopje. Halkbank has begun a continuous process of digital transformation with the implementation of the Omni-channel platform developed by their partner NF Innova, leading digital banking solution provider from Serbia. This way Halkbank changed the communication with its clients and strengthen the position of a modern bank that follows the latest trends in technology and innovation. 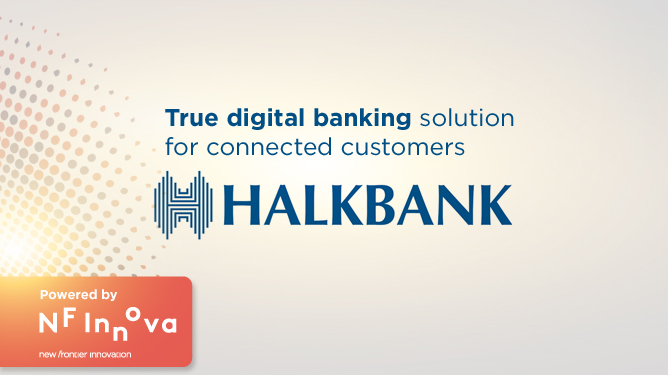 Halkbank ad, Skopje partnered with NF Innova in order to implement the Omni-channel platform that will enable consistent communication on all channels, easy administration and online banking applications for seamless customer experience. NF Innova is the right partner for digital transformation projects because besides the Omni-channel platform and accompanying applications NF Innova provides expertise consultant support. Their recent accomplishments prove that NF Innova is the innovator not lacking in ideas on how to make everyday banking simple and accessible. NF Innova is positioned at the forefront of the mobile banking future and was recognized as a leader in IDC MarketScape 2017, with its iBanking Mobile solution. The most recent accomplishment for NF Innova is that it was named one of Top 25 Fintech Solution providers by CIO Applications Europe. Halkbank AD, Skopje continuously improves their services in order to meet everyday banking needs of their clients. Having in mind the user experience Halkbank AD, Skopje and their partner NF Innova, recently upgraded existing and introduced a new set of functions for the mobile banking app for more convenient banking. NF Innova new platform includes a range of functions and a simple user interface both on the client side and on the bank side. The enhanced solution covers new design and enhanced display and navigation to the closest ATM and branch. The upgraded app also includes a public part that doesn’t require a login so it is now available for non-authorized users. With the new application users have much better overview of their current balance with functions like review of reservations – card transactions that are made but not yet realized. Funds management is also made a lot easier with options for deposit payments, credit card debt payments and payment templates. The greatest emphasis is on the “Smart Cash” service for withdrawing cash from ATMs via e-banking and mobile application. Smart Cash service provides greater flexibility in using cash which is novelty on the market and the first service of this type in Macedonia. Now you can use the mobile app to withdraw money from the ATM or send money to other person, who does not have to be Halkbank client. When a Halkbank client initiates the Smart Cash option from the mobile banking application, the recipient of the funds receives a SMS message with a PIN code. By entering the code at any Halkbank ATM in the next 12h, the recipient can withdraw money without using the card. By introducing this service, Halkbank once again proved its leadership in innovations and will continue to disrupt the banking sector in Macedonia with continuous development of digital banking services. “The banking sector is undergoing a transformation driven by the change in people’s communication habits. The Internet availability created the need for a completely new approach in communicating with clients and in ways to satisfy the expectations of today’s “connected” client. What we want to achieve with our solutions is straightforward communication and convenient banking which is exactly what Halkbank is delivering to its clients. With the Omni-channel platform in place, Halkbank is more adaptable to change and much quicker in delivering product to the market, always ready to answer to high demands of a modern banking customer.”, stated Mr. Milan Pištalo, Account Executive at NF Innova. “The process of modernization and continuous enhancements of the banking services is constantly present, being a must for the competitive advantage in acquiring new, satisfied clients since both banking and finance sector, on a global level, are particularly dynamic. People know what to expect from a company, and they precisely know how valuable they are for the company. So, it is up to us to find the proper way to meet, and even further, to go beyond their needs, by always providing them with more value added services, innovative products and customer care as they deserve. We are constantly investing in new technologies, improving our clients’ experience through the alternative channels of distribution, that have become regularly used by our client who are shifting their transactions away from Bank’s branches to their “own personal branches” at their home or wherever they are , by using the e-banking and mobile banking application. Together with our partner New Frontier Innova, in a very short time after introducing the mobile application for retail and legal entities, we have implemented our new, improved and more “user-friendly” mobile application upgraded according to the needs of our clients and their daily habits. Our new and improved platform was positively accepted by our clients, as a result of the increased number of functionalities and their simplification. At the same time, our new Smart Cash service, being a complete novelty on our market, offers our clients a unique advantage for withdrawing money without using a card, which makes the usage of our ATMs now more flexible than ever before. Current trends focus on even greater personalization, digitalization and creation of added value and exceptional experience in the use of financial services. Therefore, it is up to us to find the proper way to meet such demands, by always providing them with more value-added services.”, stated Mr. Atila Selim, Marketing Manager in Alternative Distribution Channels Department of Halkbank AD Skopje.